December was a busy month with tourism website design here at InsideOut! Along with enjoying some time off for the holidays and employee vacations, the team managed three new responsive website launches. 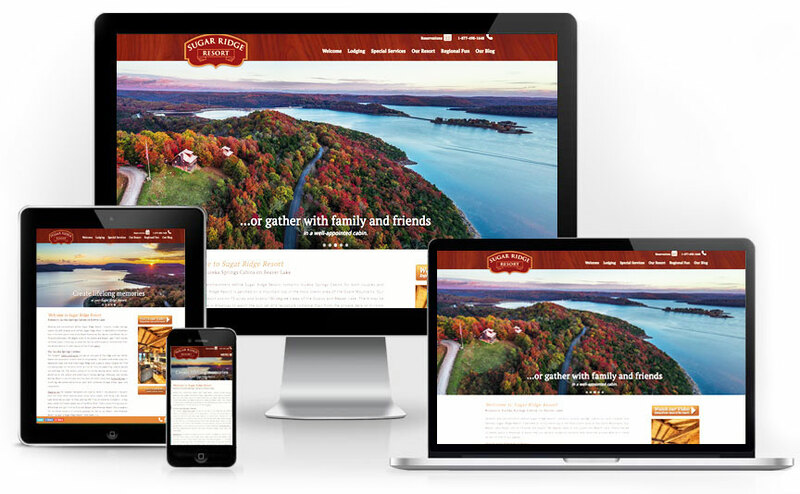 We’re proud to present new responsive websites for Sugar Ridge Resort, Katy House, and Elmwood Farm! Sugar Ridge Resort is a beautiful property where all cabins and suites enjoy the expansive views that help make Sugar Ridge such a special place. The setting is romantic for couples, while families will find the space they need to spread out and have fun. Though their original tourism website design had served them well, it was time to get a fresh start with fresh code. Lead web designer, Beth Edwards, worked with the resort on updating the site to provide visitors great photos and info in a more user friendly layout. The new site is easy to edit, loads fast, and looks great on any screen size. We’re proud to have called Sugar Ridge Resort clients since 2010 and look forward to our continued business relationship! This Texas Bed and Breakfast is located in the beautiful town of Smithville, in Central Texas. The Katy House Bed and Breakfast joined the InsideOut family of clients in 2008. The original site we built years ago was perfect for the previous owners and the inn’s decor, but time had passed and now there were new owners. Linda and Stu needed a site that reflected their personalities and the inn today; a charming turn-of-the-century home that has been lovingly restored to its original beauty. 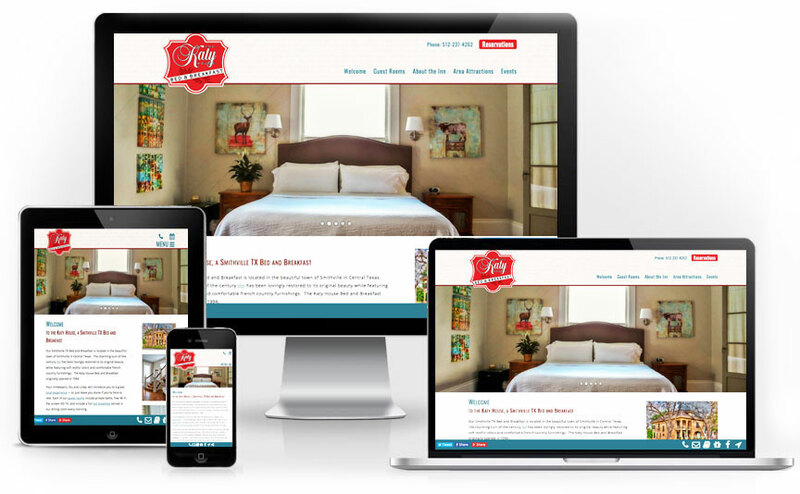 Stu and Linda worked with Jack Waknitz who was able to capture the inn’s updated personality. The new website allows Stu and Linda to update photos, text, and prices whenever they want – and from the comfort of their own home. Elmwood Farm is one of those magical places that just keeps getting better and better. When InsideOut first met the owners, they were refurbishing their old family farm. We provided a tourism website design that could evolve with them as their property evolved. First, we added a home page with a blog that they could show their progress in. As rooms were finished and made available for guests, they were added to the site. Pretty soon, weddings in the old farm house became an option, so that info was added too. Over time, what was once an old, rundown, vacant farm had become a superb B&B and event facility, complete with barn. Piecing together the website to grow with the business worked well for years. After a time, however, it became clear that a new tourism website design would better show off all the new features, photos, and text. Innkeepers (and sisters), Salena and Lettie, applied for a grant through the Tri County Council of Western Maryland to help them update their website. Along with lead designer Beth, they formed a proposal to the Council showing how the farm’s event venue could help tourism in the area. The Council agreed and helped fund the project. 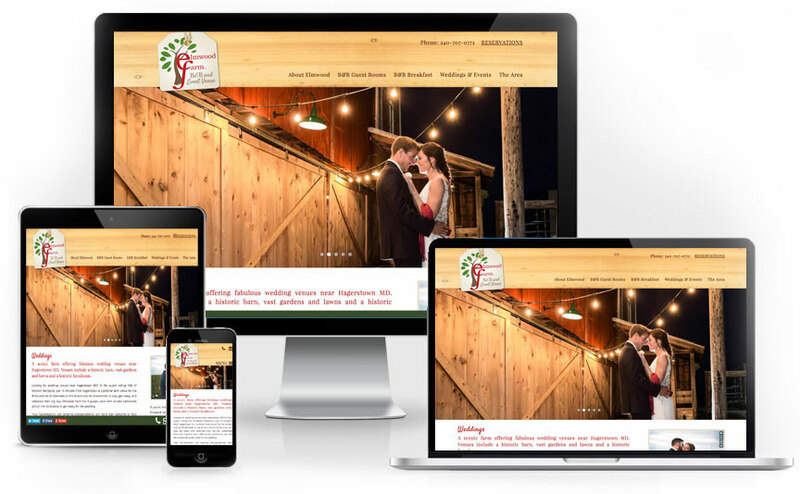 Now Elmwood Farm B&B and Event Venue really shines on the web and is able to properly showcase all they have to offer the area and its visitors. What Is Concept Themed Tourism Website Design? InsideOut is proud to be a leader in tourism website design. Each new, responsive website launched in December was built on one of InsideOut Solutions’ Concept Themes. As you can see, they have similar layouts, yet capture a unique feel for each property through their own textures, colors, photos, logos, and text. These pre-coded WordPress themes designed by InsideOut Solutions allow for a faster turn around time and tighter budgets. The time frame for a Concept Themed site, as mentioned above, can be quite fast. Once we have all your materials, build-out to launch takes only 2 to 4 weeks! Plus, you get the same quality assurance with our Concept Themed responsive website as you do with our Custom websites. All of InsideOut Solutions websites follow up-to-date design and development standards, including responsive design, WordPress, HTML5, and SSL certification. This allows you to rest easy, knowing your site is safe, secure, and serving your visitors. If you’re looking for a new responsive website, SSL certification, site upgrade, or what have you, let us know! We look forward to working with you!